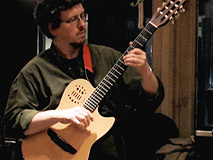 ​Steve Osburn - Classical Guitar, Bass, Chapman Stick, Keyboard, Music Environment. Steve Osburn has been "living music" for more then 20 years, sharing his knowledge with people of all ages. As a young classical guitar virtuoso, he studied at Interlochen, two years in the All State and one year in the U.M. Division. Steve studied with Nelson Amos at Eastern Michigan University and performed for Master Classes with Michael Lorimer and Manuel Ramos. Steve also plays a unique and rare instrument, the Chapman Stick, which is a cross between guitar, bass and keyboard with 12 strings. His mastery of Stick led him to teach it at the prestigious National Guitar Summer Workshop in Connecticut. The New England Montessori Teacher Training Center helped define his goal to provide the best musical education for young people and adults. Students enter a world of music, and learn how to express themselves through sound and rhythm. Musical games explain notation and theory, and every musical instrument family is represented. Appropriate size guitars, drums, keyboard, violins, woodwinds, xylophones and brass wait in the Music Environment ready for exploration and mastery. "The perfect place to discover the best instrument for you or your child." Steve offers a sliding scale based on number of students. Lessons are 25 minutes in length, and start at 5 minutes past the half-hour. Contact: (734) 476-5153, or email Steve. Music Environment Field TripsSteve is now offering field trips for student groups to participate in unique musical experiences. Field trips include tours of Oz's Music Store, teaching and recording studios, and exploration of The Music Environment. Tour participants are offered the opportunity to perform at their own "Open Stage" or join a Music Environment "Big Bang" Drum Circle. View the PDF or call Steve at 734-476-5153 for more information.